Although the forecasted ‘heatwave’ hasn’t quite materialised up here as it seems to have done further south, nevertheless the predictions for today were favourable, unlike yesterday when much of Cumbria was shrouded in low cloud and rain until mid afternoon, and we were all wondering if our portion of the sunny weather would ever arrive. 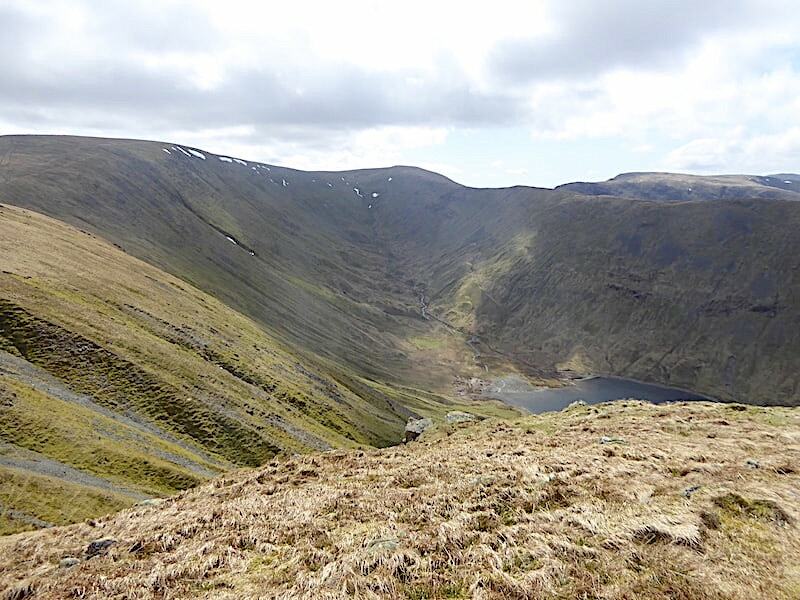 Despite the ongoing back problems I was determined not to miss out on today’s chance and so we planned a not too strenuous walk starting in Bannerdale with plenty of options for a change of route should the need arise. 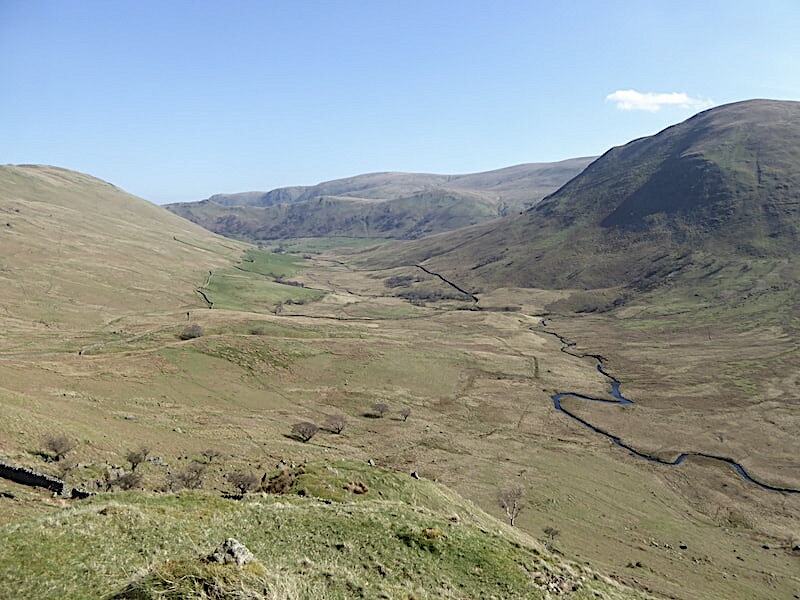 To give my back a helping hand, just as we did with J’s broken foot a year ago, we drove up to Dale Head and parked roadside just below the farmhouse, thus avoiding the long walk in on the tarmac lane along the valley. By the time we got back to the car I was thankful that we did because after walking just a fraction under eleven miles I don’t think my back muscles would have been up for it. 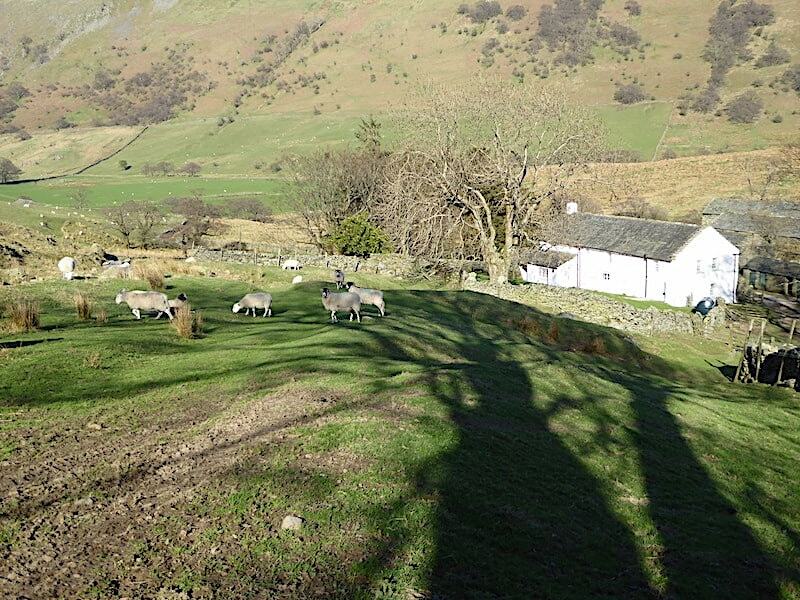 Its a beautiful morning as we park up near Dale Head Farm where there is a very limited amount of off road parking below the farm buildings. The tarmac lane ends at the farm at a turning area and where you are asked not to park. 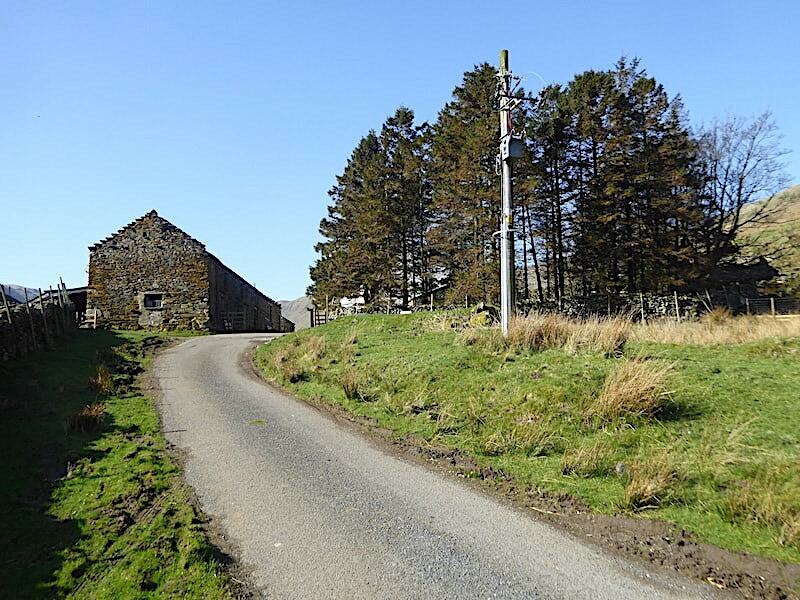 A few years ago the farm seemed not to be in use as a working farm and stood empty for some time but on our last few visits up here we have noticed gradual signs of refurbishment and eventual residency. We had the opportunity to talk to one of the residents, a woman who came out to tell us that we would need to climb the fence next to the gate leading to the footpath because they had stacked a metal gate in front of the wooden one. This was to stop the sheep squeezing through the large gap between the bottom of the wooden gate and the ground and the few sheep corralled below the gate looked none too pleased about this denial of freedom. Seeing as we weren’t similarly denied we climbed the wooden fence and continued on our way. 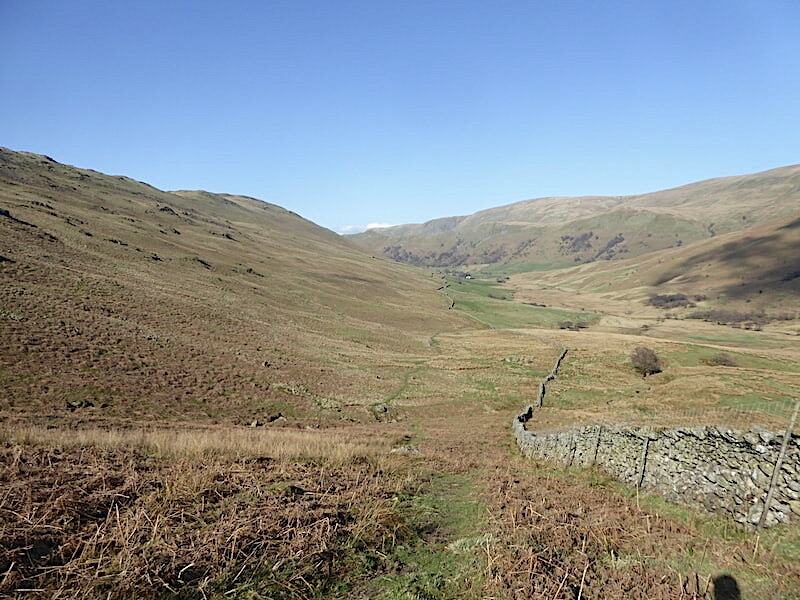 Looking along Bannerdale up to Bannerdale Head as we climb the footpath up the hillside from the farm. 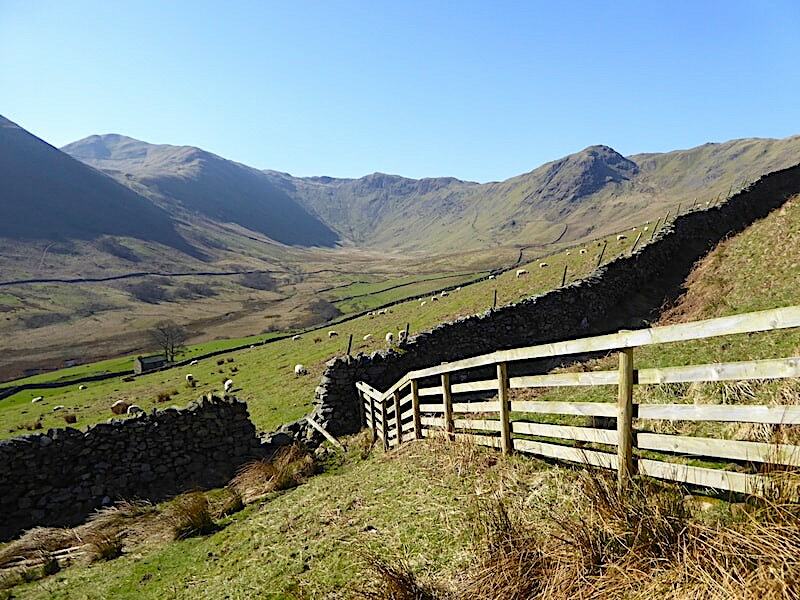 When we reached the stile in the fence I decided it was much too warm to continue in the trousers I’d started out in so my shorts came out of the rucksack and got wrapped around me instead. As the morning was warming up nicely we decided that we didn’t need to wear our lightweight jumpers any longer either so they came off too and got stowed away along with my redundant walking trousers. After six months of not seeing the light of day our lower limbs might have looked like uncooked chips but it was blissful to feel the sun and the breeze on them once again. We chose not to follow the footpath alongside the wall. It rained for a good part of yesterday and we knew it was likely to be still quite wet down there so we climbed a little way up the hillside and then veered off left, towards Heck Crag, on a higher track hoping for drier ground underfoot. It was much less soggy on the higher ground although still very juicy around the numerous becks and springs. 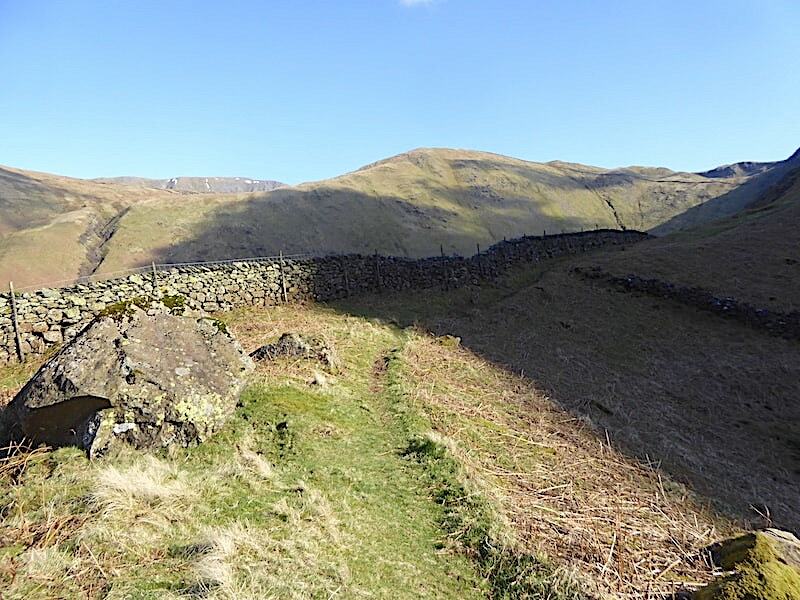 It is possible to follow the wall all the way along but it is a rough old climb and its much nicer to walk the higher level path which passes some distance above the wall but below the rocky slopes of Heck Crag. 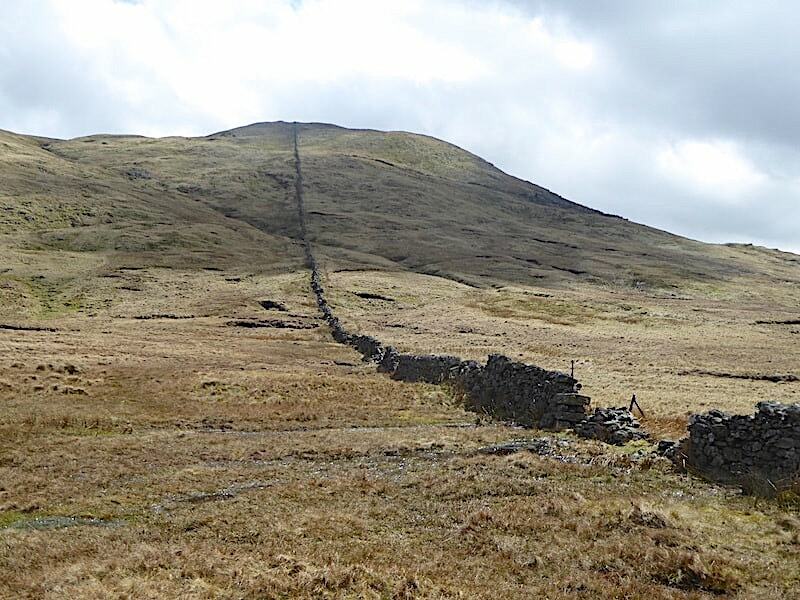 We keep to the higher ground and head towards the bend in the wall where we will join the footpath alongside the wall. 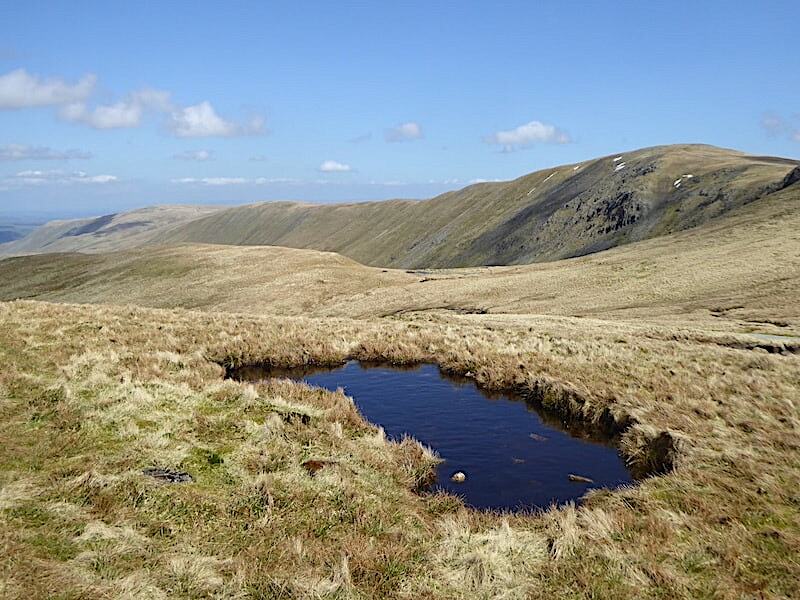 From the bend in the wall the path climbs above and around this reedy tarn in a hollow below Heck Crag and continues on its traverse across the slopes of Beda Fell. 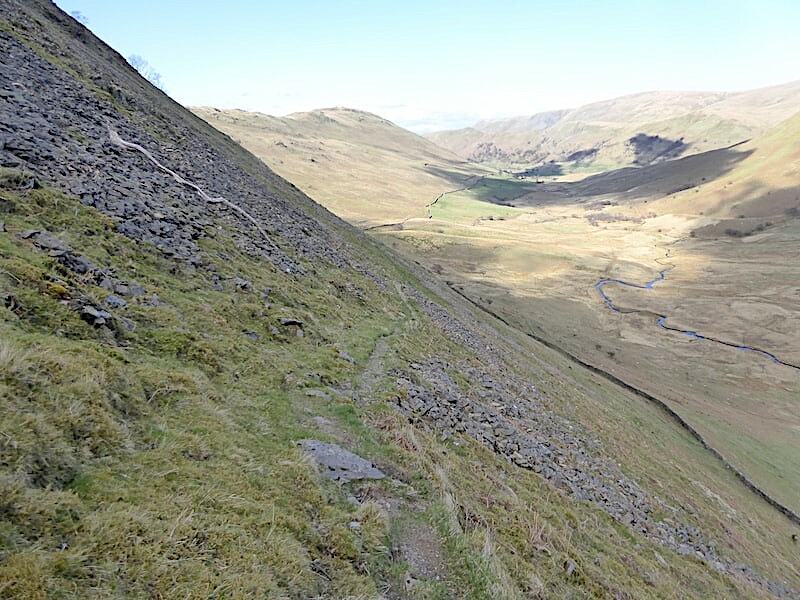 The view back along Bannerdale as we climb the narrow traverse path. 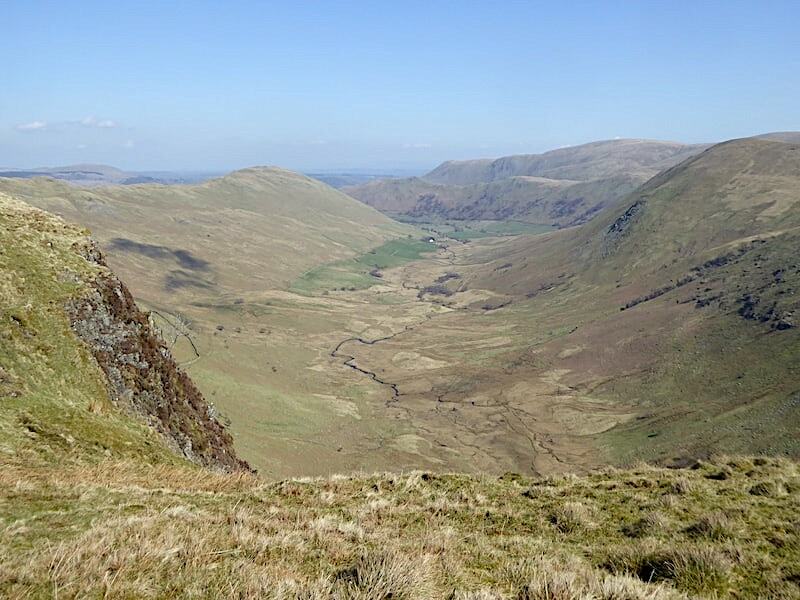 Bannerdale Beck snakes its way through the marshy valley bottom on its way to join Howe Grain and eventually Ullswater. 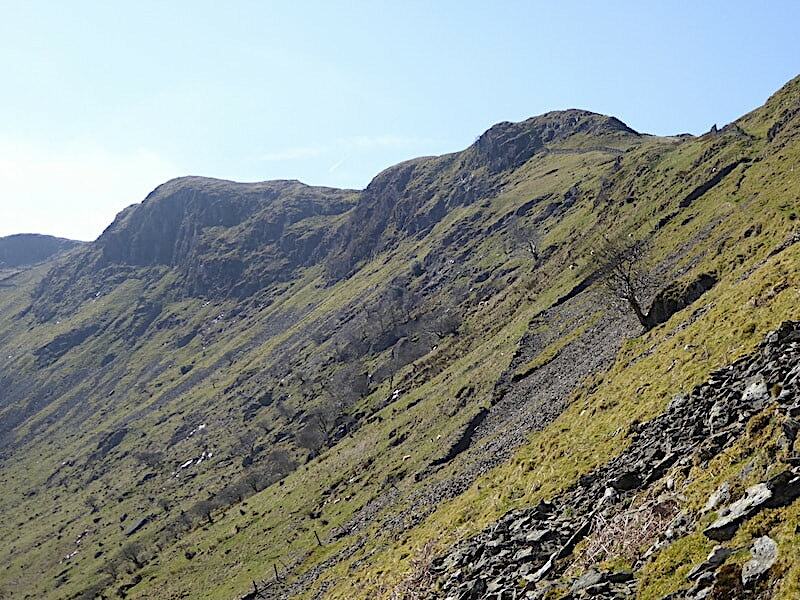 Views of Buck Crag and Satura Crag ahead of us as we continue along the high level path. It looks steeper than it actually is and and quite a few sections along the way are either level or only rise quite gently. 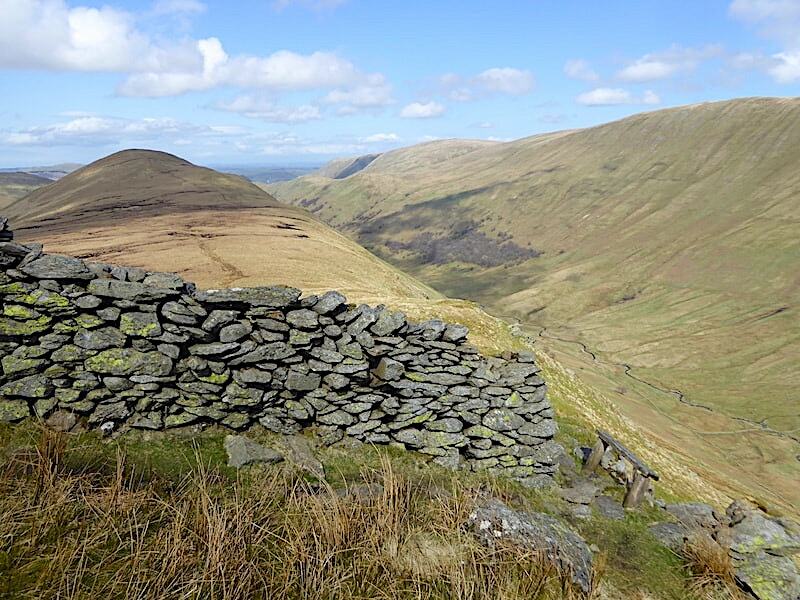 Walking alongside the wall is a different kettle of fish altogether, its steeper, rougher and, when the bracken is up, is an absolute pain in the proverbial. 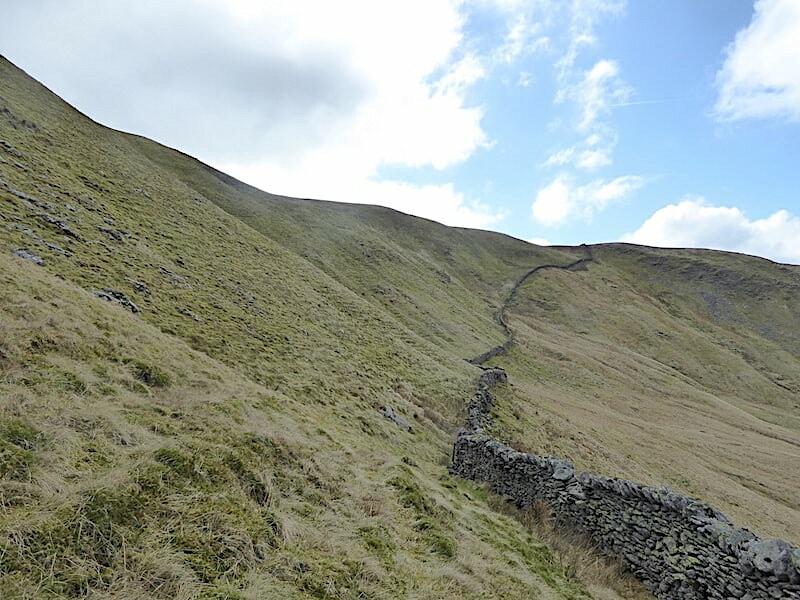 Another look back along Bannerdale as we reach the point at which the path and the wall more or less meet up with each other. As can be seen this section of the path has worn down into a narrow trench in some places but its easy enough to avoid if needs be. As we had stopped to take the previous shot we had a look across to the slopes of The Nab as usual, ever hopeful that we might see some deer. Its usually a forlorn hope but we were in luck today. 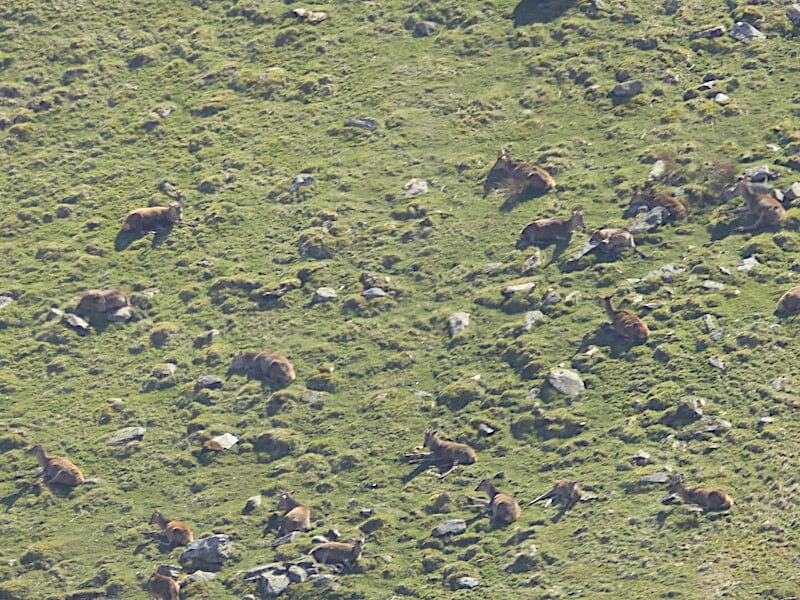 I thought I saw some movement so J got out the binoculars to make sure, then, with as much zoom as the camera could muster, I managed this shot of some of the red deer quietly enjoying the morning sunshine. 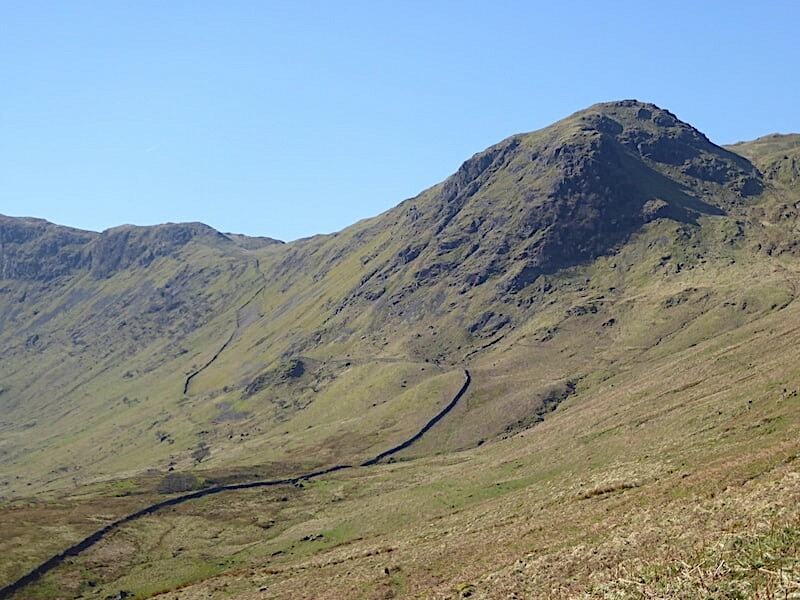 We carry on climbing a little more steeply to the point where …..
….. the path veers away from the wall just below the slight rise on the right leading up to this flatter area from where I took a look back down Bannerdale. 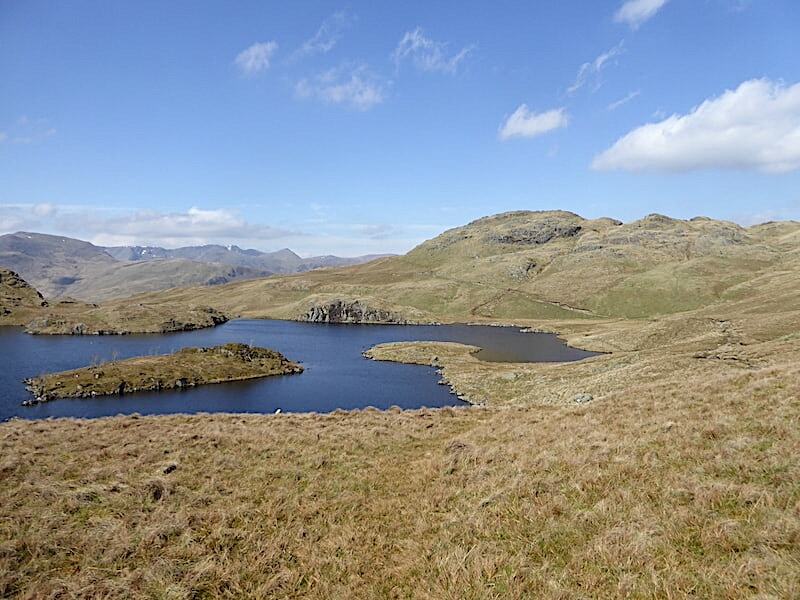 From here there’s just another short climb which leads to …..
….. the very enchanting sight of Angle Tarn, bathed in sunshine and not a soul around. Time for a couple of photos and a Mars Bar break methinks. 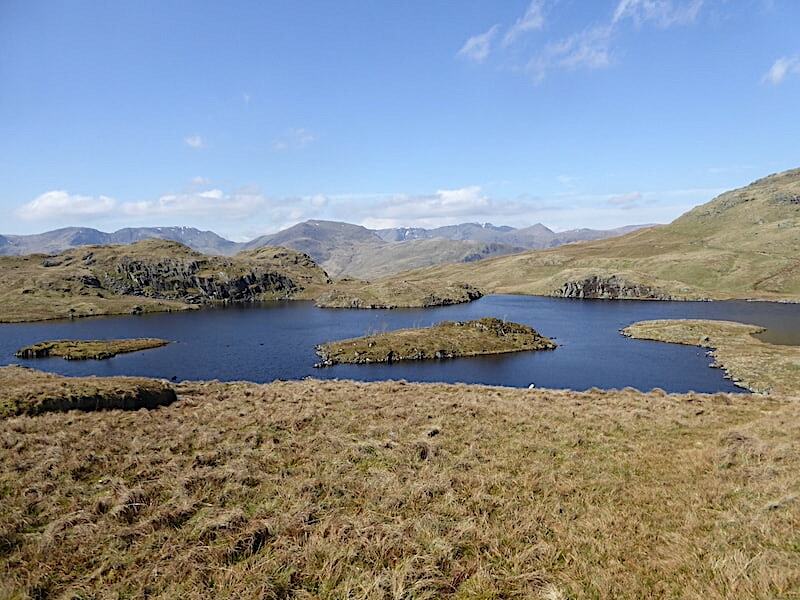 …..
After a short break we tear ourselves away from the peace and quiet of Angle Tarn and make our way along the path towards Buck Crag and Satura Crag. 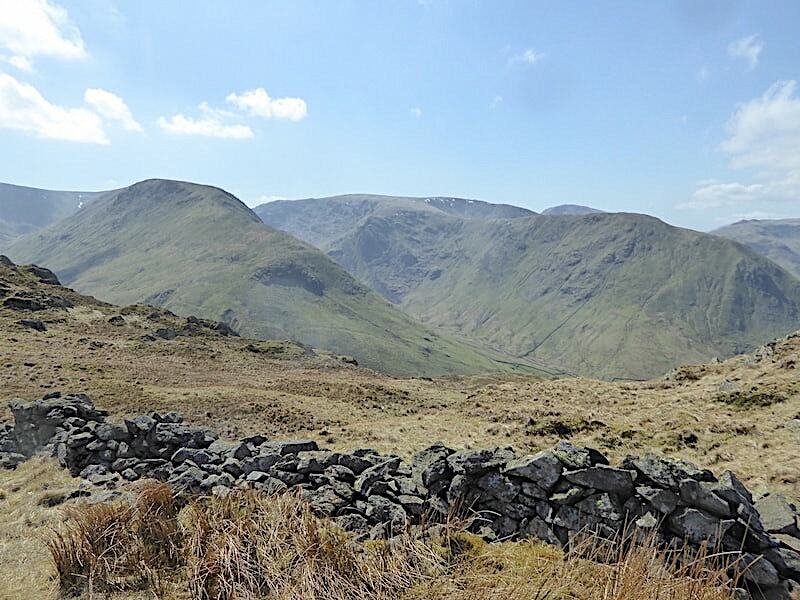 Over to our right there’s a clear view of the cairn on Brock Crags …..
….. and on the skyline behind Brock Crags are, from left to right, Dove Crag, Hart Crag, Fairfield and Saint Sunday Crag. 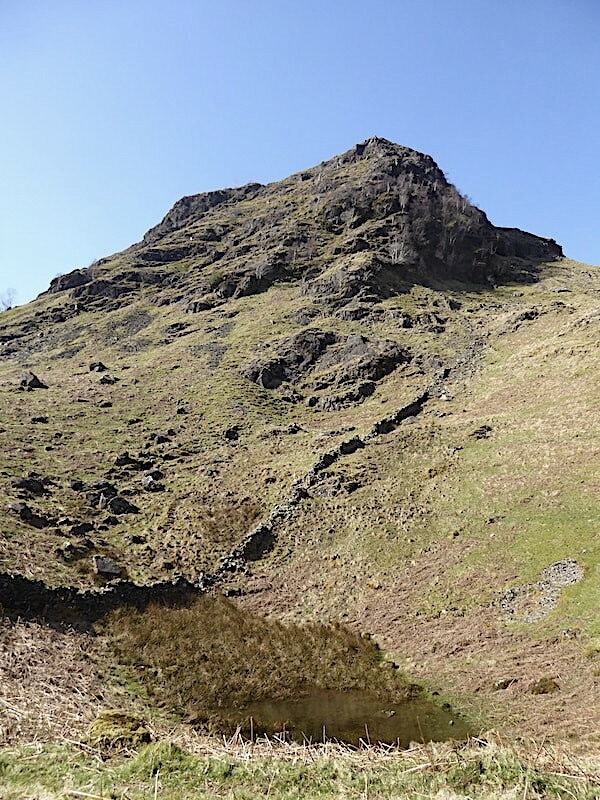 A view along the length of Bannerdale as we cross over Buck Crag. There’s a slight haze around today which usually happens when the air flow is coming up from the south as it is today. 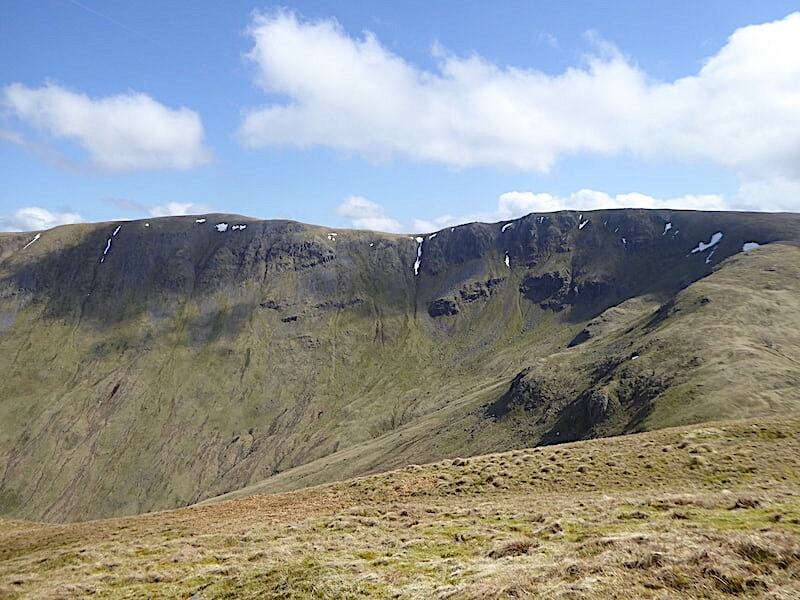 We reach the familiar gateposts on Satura Crag with Rest Dodd on the skyline beyond. 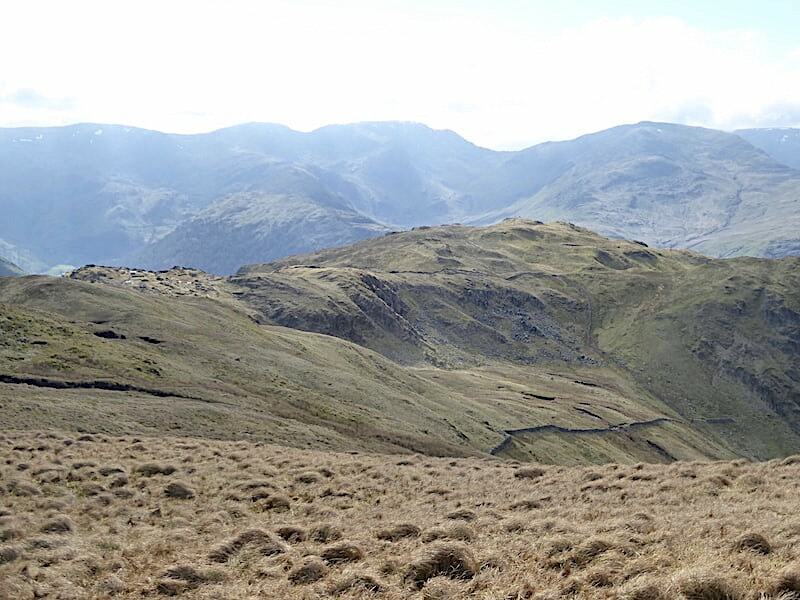 We continue on beyond the posts with views of …..
….. Gray Crag to the left, Thornthwaite Crag in the centre and Hartsop Dodd on the right. 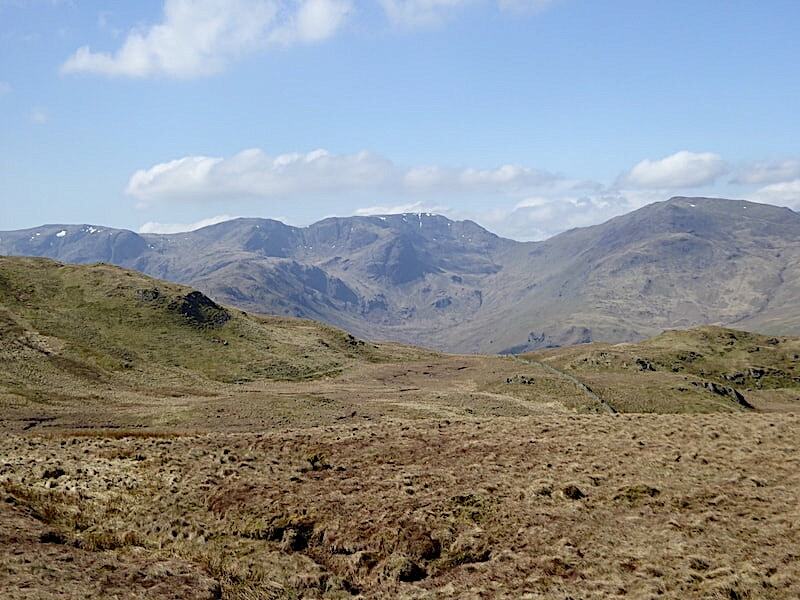 The terrain gets a little rockier further on but there’s nothing difficult to deal with and two of the fells we’re planning on visiting today are now in view. 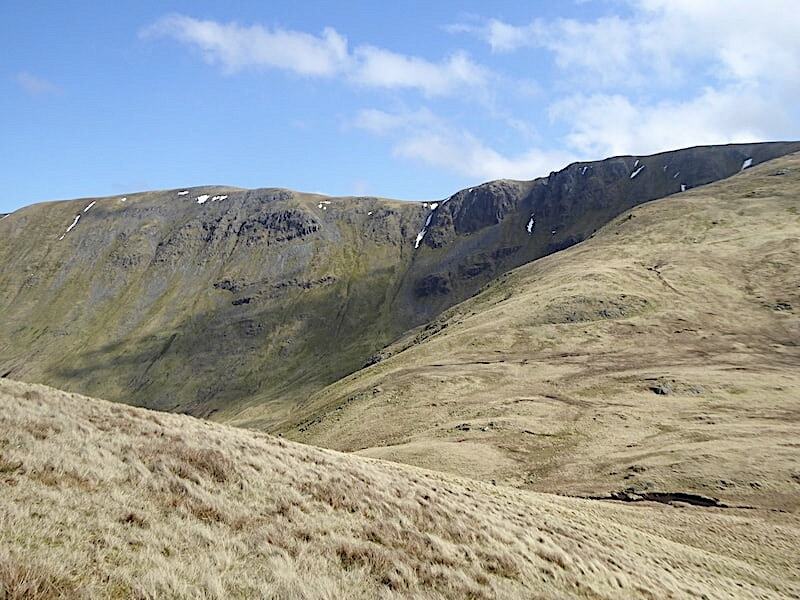 Rest Dodd is over to the left and to the right of it is The Knott. 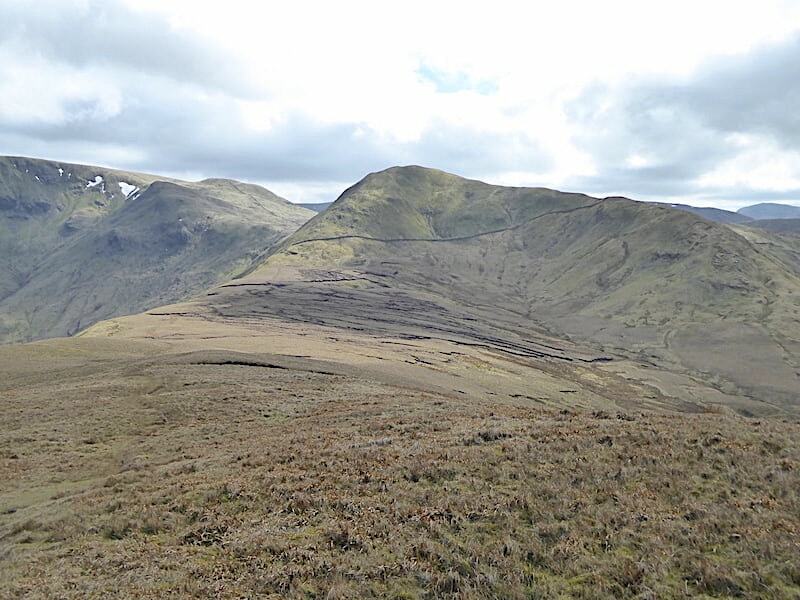 The darker area on the skyline between the two being Rampsgill Head. Over on the extreme right High Street has snuck into the shot. 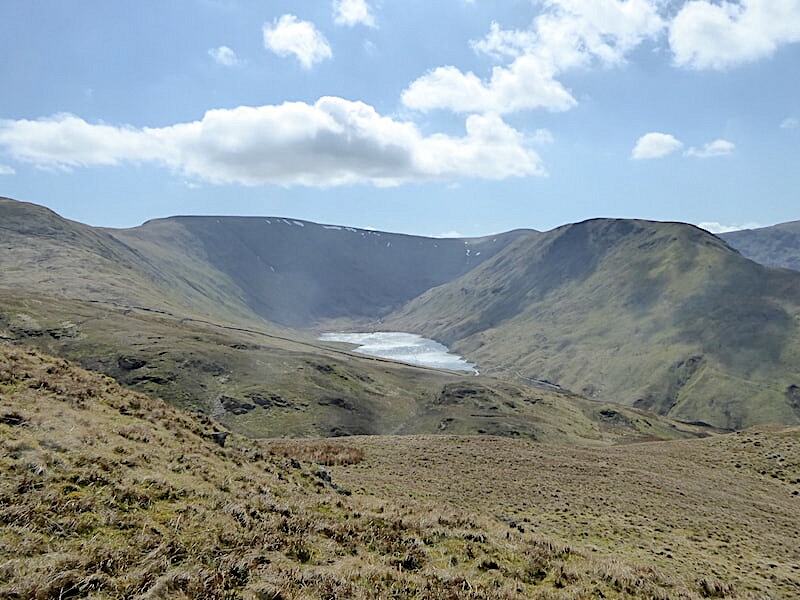 A silvery glow on Hayeswater tucked in snugly below High Street and Gray Crag. We hadn’t realised it yet but at this point we are not quite going in the direction we wanted to be, we must have been too busy putting the world to rights, as usual. As I stopped to take this shot looking to the west of us the penny finally dropped. 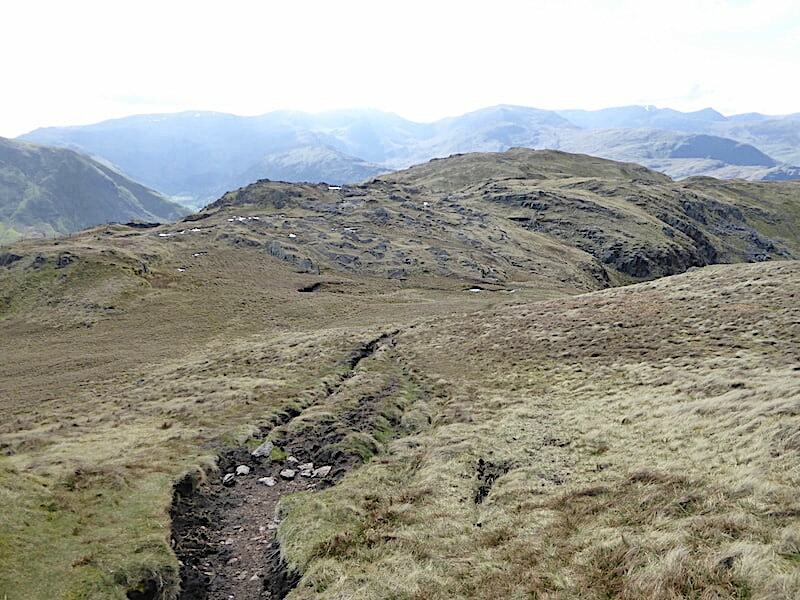 All of which meant that we had continued on the Rest Dodd path instead of keeping to the path up to The Knott, which was now clearly visible just below us. That’s what comes of putting the world to rights and not keeping an eye on what we were doing. No matter, it was only a case of dropping a short way down the slope and meeting up with it again. Back on track now with The Knott directly ahead of us. 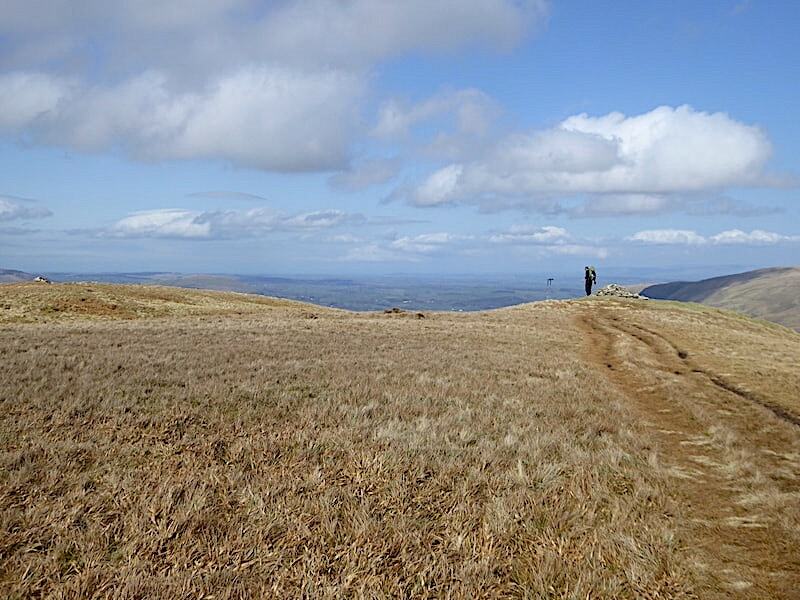 There were a few walkers dotted around here and there but not as many as we had expected to see on such a lovely day. 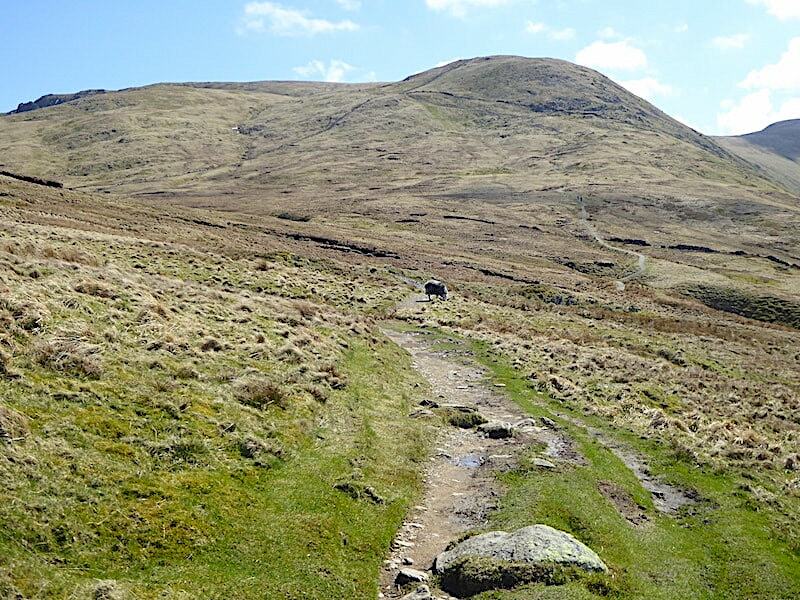 We follow the long and winding track and …..
….. eventually take a right turn off it to climb the short distance up to the summit of The Knott. 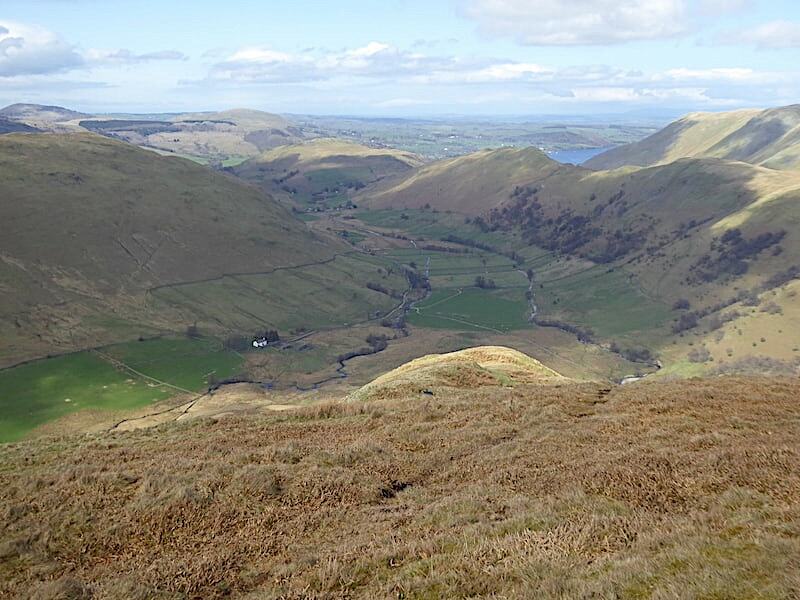 On the skyline is the long moorland sweep beginning at High Raise on the right and which ends at Arthur’s Pike high above Ullswater. 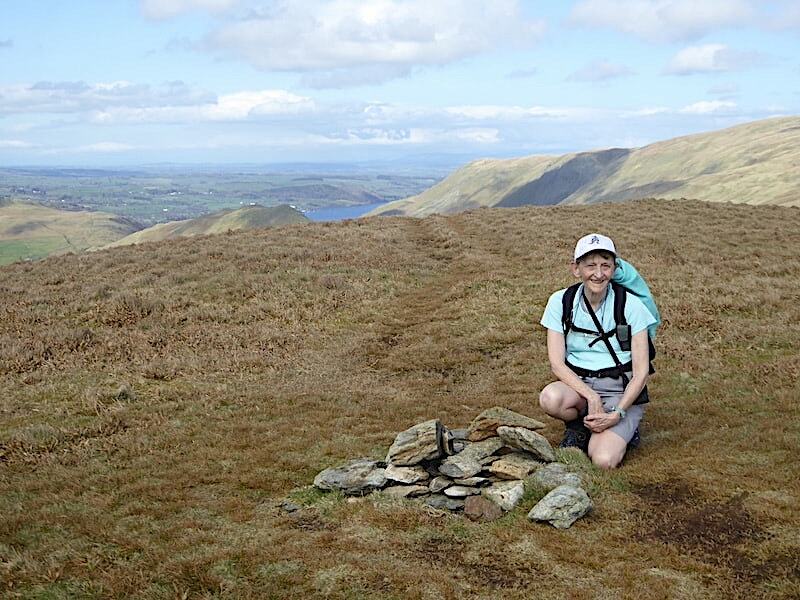 It was blowing a right old hooley up here on the top of The Knott. Fortunately the wind was blowing towards me so there was no danger of me being hurled into Hayeswater but it was very difficult to stand and take the shot. My cap was whipped off my head and ended up dangling across the back of my neck held there only by the two very large grips I had secured it with to begin with. It it hadn’t been for them it would have been on its way to Ullswater at this point. 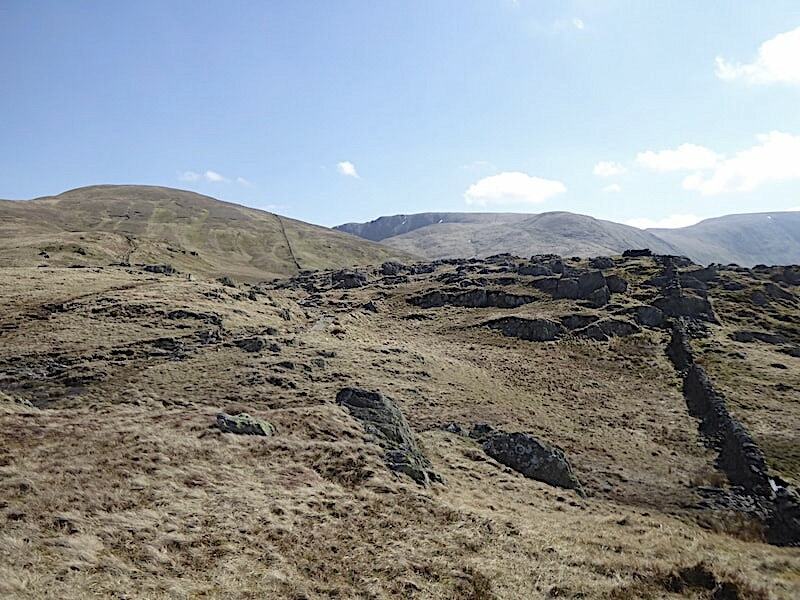 I retreated back to the cairn for a couple of quick shots, this one of High Raise beyond the cairn …..
….. and this one looking across to the path leading up to High Street …..
….. and then we retreated out of the wind down the slopes of The Knott, where an inviting little swathe of grass alongside the wall offered a comfy spot to have a break and indulge in a spot of refuelling. The wall below us continues down to cross the path and then rises again up the slopes of Rest Dodd, to the right of which is The Nab, our final fell for the day. 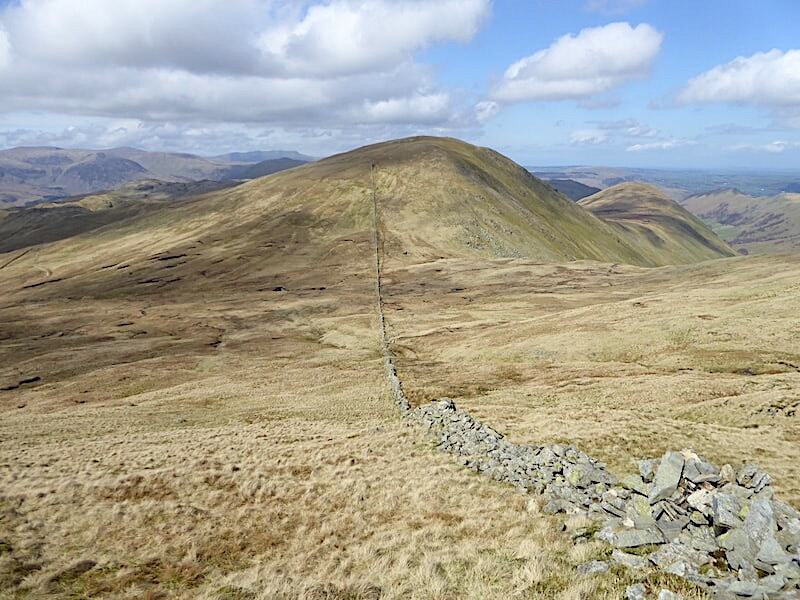 After lunch we headed back down to the path which passes between Rest Dodd and The Knott, crossed over it and began our journey over to Rest Dodd summit. 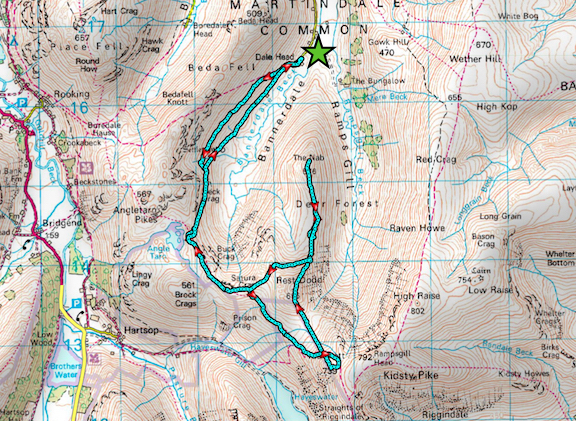 While having lunch we had noticed a walker doing just the same but he had walked to the right of the wall and on reaching the marshy area at the bottom seemed to be having to take some very wide detours to avoid the worst of the morass. The left side of the wall appeared to offer less moisture underfoot so that’s the side we kept to. 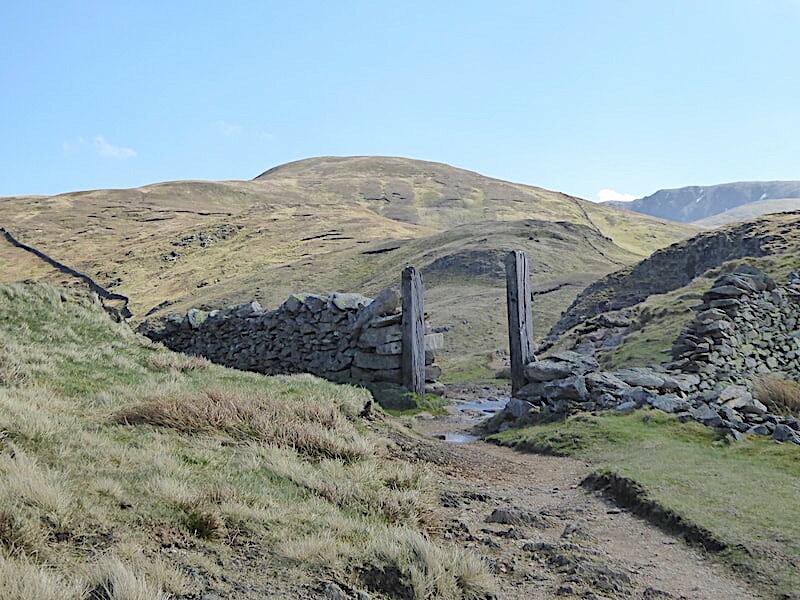 We reached the marshy area without any wide detours and at the break in the wall we crossed over to this side from where I took a look back at The Knott. 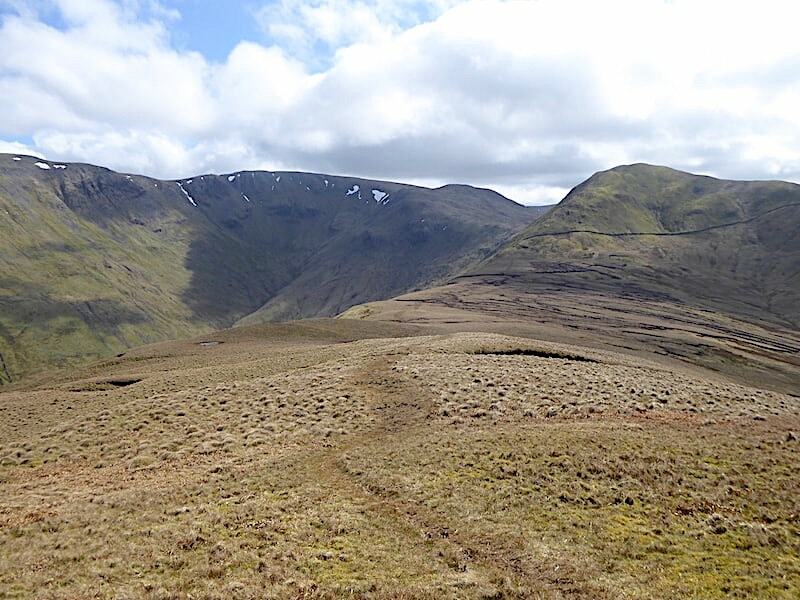 Ahead of us is the climb …..
….. up the slopes of Rest Dodd with a look over to High Raise and Rampsgill Head on the way up. 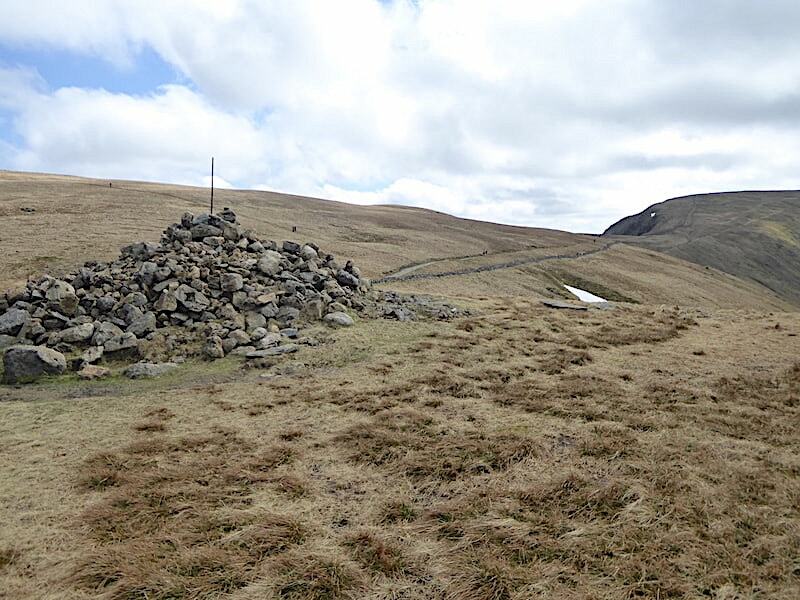 Its a steepish climb but not a very long one and before long …..
….. we are approaching the summit cairn where a lone walker is standing and taking in the view. 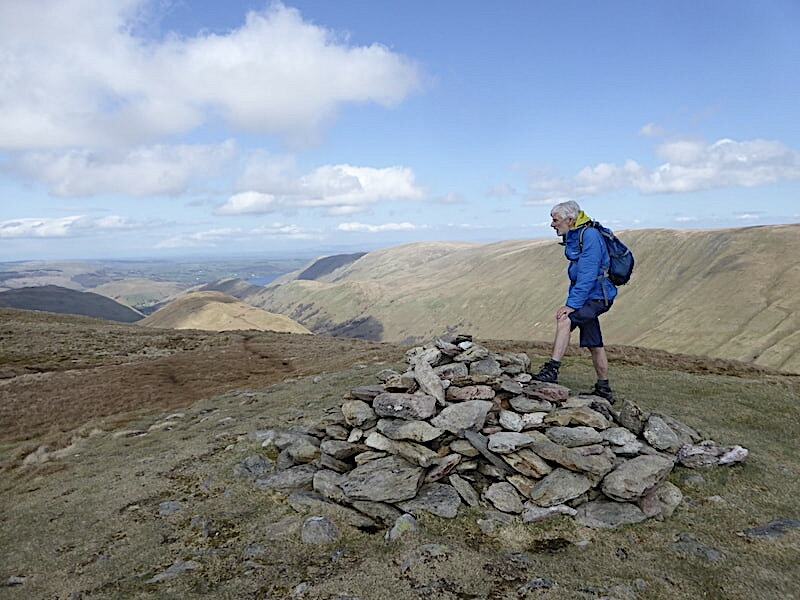 He strolled across to the smaller cairn over on the left for the view from there, then returned to collect his walking poles and, after quick greetings between the three of us, continued across Rest Dodd and then down on his way to The Knott …..
….. leaving us to the mercy of the strong winds once again. Notice the jackets are back on again and its chilly enough to raise goosebumps on exposed flesh. 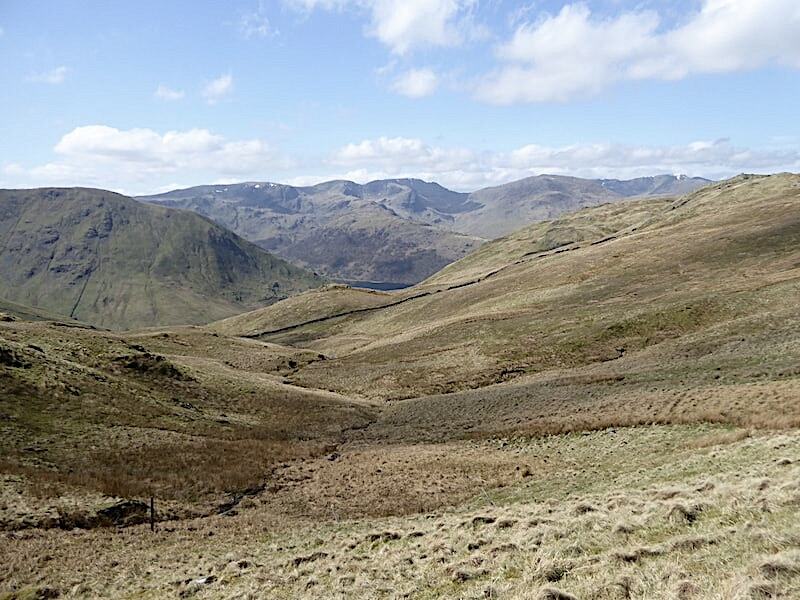 If it hadn’t been so much of a faff I might have put my longer trousers back on again, we’d also be heading down to The Nab after a few minutes with our backs to Rest Dodd and so out of the wind, so it was just a case of putting up with it for a time. 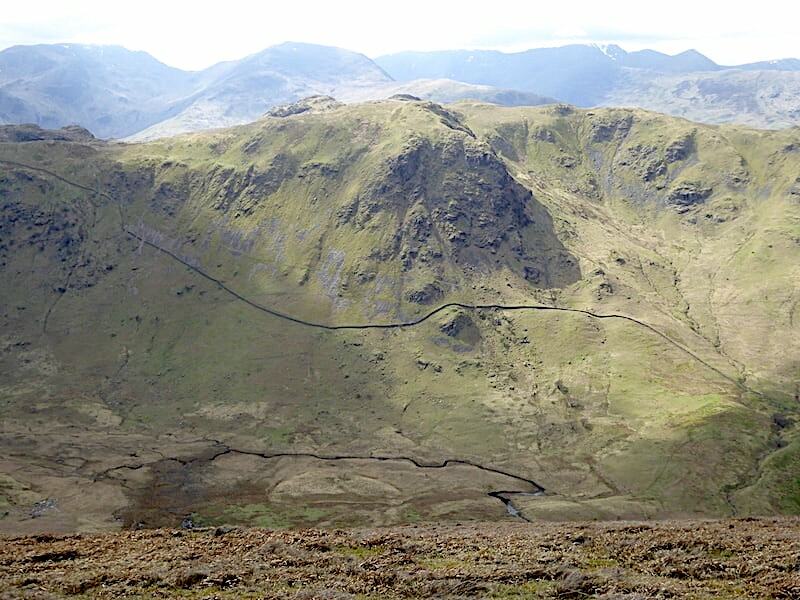 From the summit of Rest Dodd is this view of High Raise, on the left, leading over to Rampsgill Head on the right. 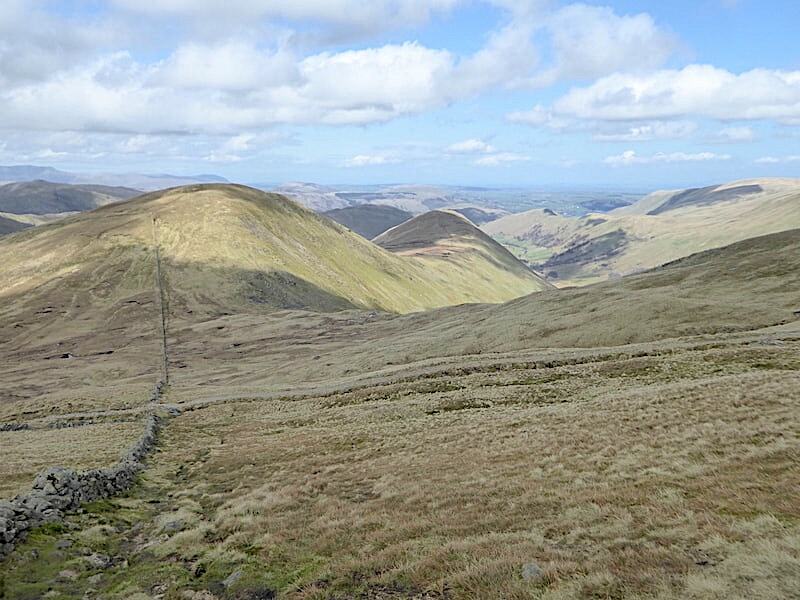 From the cairn we follow the northward path and begin dropping down it to the wall between Rest Dodd and The Nab. 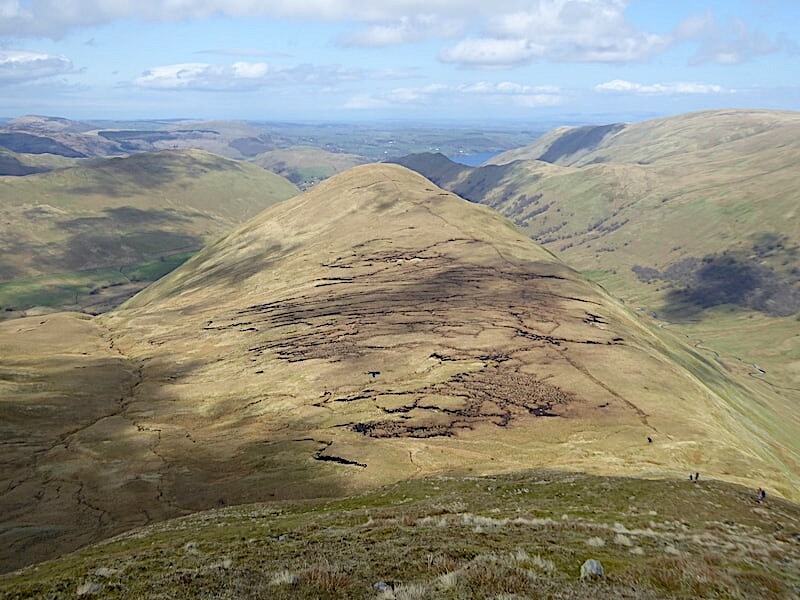 Two pairs of walkers below us are very steadily and slowly making their way up because this is a hellishly steep way up to the summit of Rest Dodd. 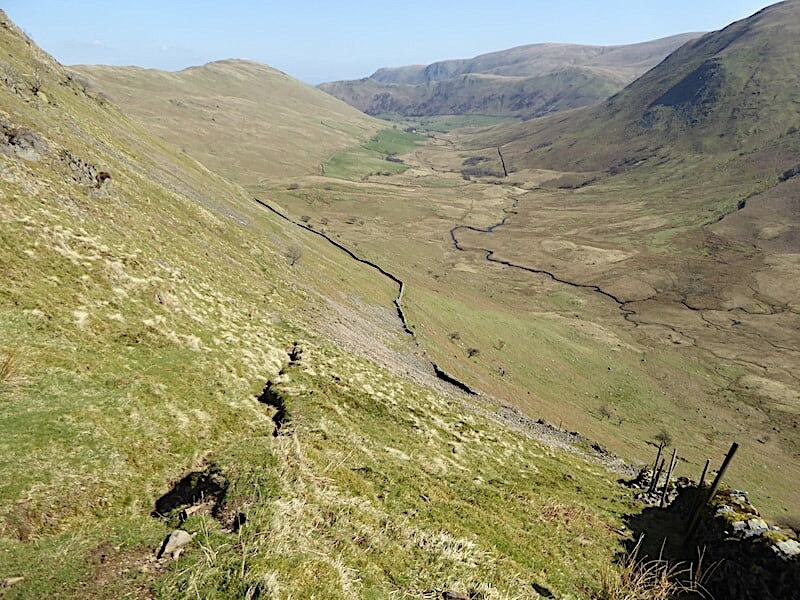 We had a quick chat with both pairs, perhaps they were glad of the chance for a quick breather, and then carried on down …..
….. to the wall where the old rickety stile once stood. Part of it still stands but the fence to which it was once attached has broken away, maybe it was no match for the weight of the heavy winter snows, and the remnants of it now lie on the hillside below. 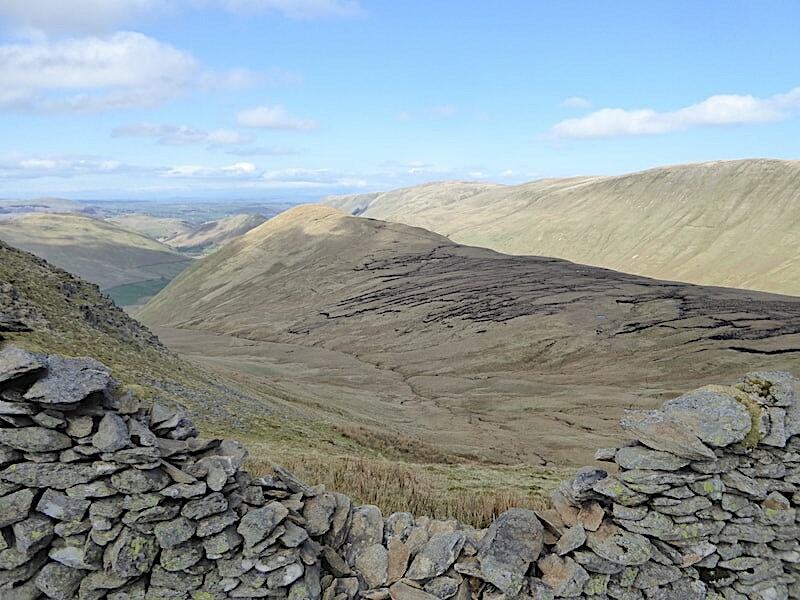 Since there is no fence left to cross what remains of the stile is now obsolete and we simply walk through the gap and down onto The Nab. 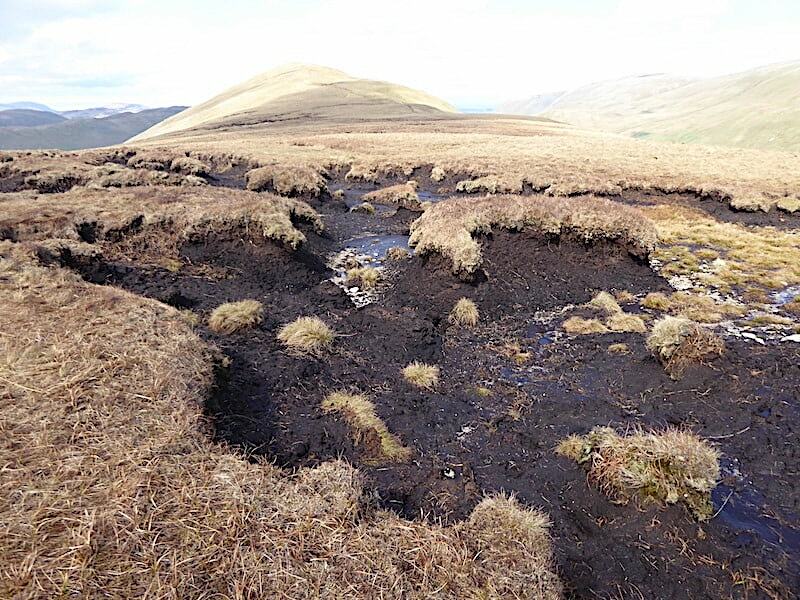 We try to keep as far to the right of the peat hags as possible but sooner or later you come up against a few of them so its just a matter of finding the best way through, or round, them as you can. Beyond the peat hags the ground improves and with nothing much to slow us down we are soon at the summit of The Nab and looking down into Bannerdale once again. The little white house is Dale Head Farm where the car is parked although its not visible in this shot. 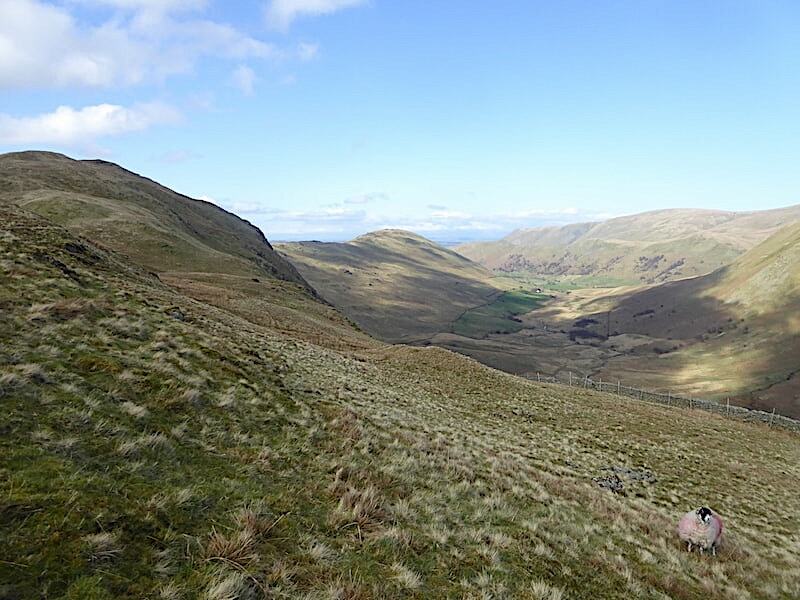 A little smidge of Ullswater is visible behind Steel Knotts and beyond it the flat lands of the Eden Valley with the smoky grey North Pennines on the distant horizon. 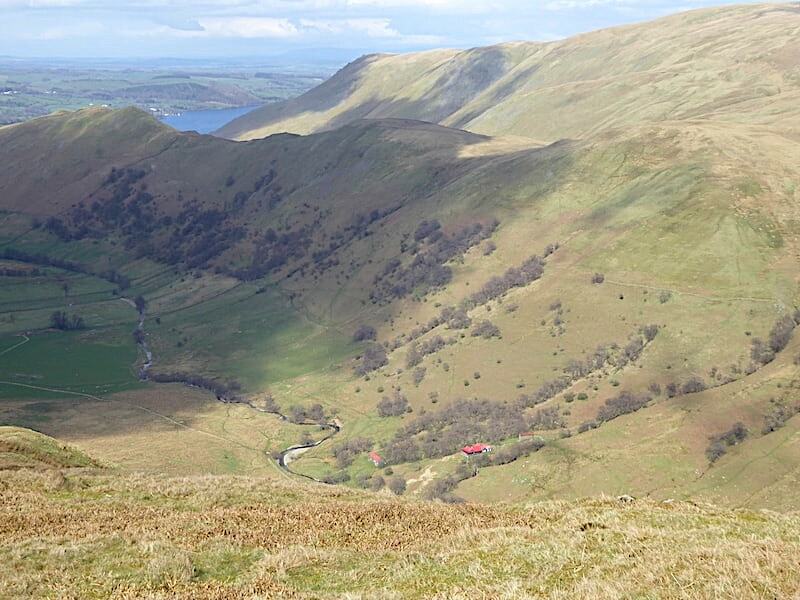 On the slopes just above Rampsgill Beck is the familiar red-roofed bungalow belonging to the Dalemain Estate. It was built in 1910 as a shooting lodge in which the Earl of Lonsdale could entertain his visitor, Kaiser Wilhelm during the Martindale deer shoot. If you have the inclination, and the money, its available as self-catering accommodation for up to twelve people from April to October. Wonder what Kaiser Bill thought of it, or if he even remembered it four years later when our respective countries were fighting each other in WWl. From the summit a look back along the peat hags to Rest Dodd and if you zoom in you might be able to pick out the very steep path rising up its slopes from the wall. 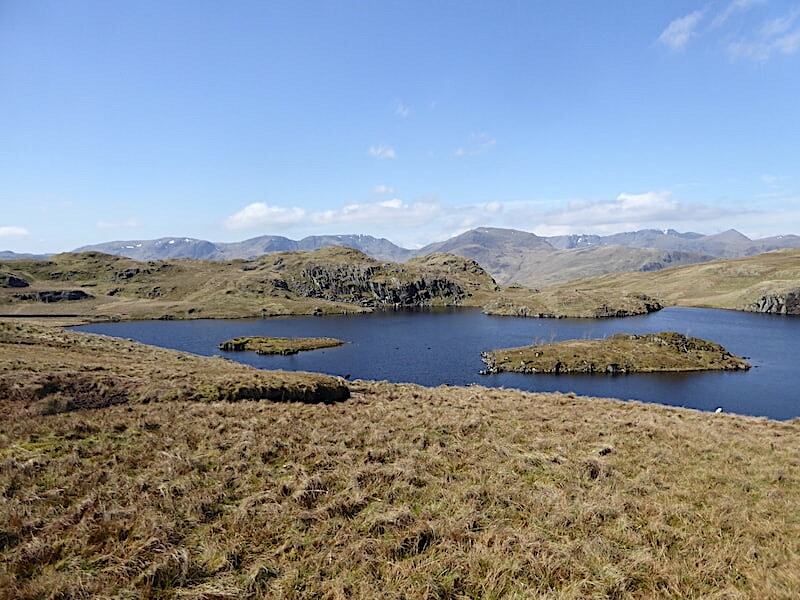 When we return to the wall we will turn right and follow it back over to Angle Tarn. Across Bannerdale a view of Heck Crag from the summit of The Nab. Another zoom in might reveal the high level path which we followed this morning. It begins near the little hollow above the wall, on the right of the prominent outcrop below the wall, and continues across to the point where it meets up with the wall once again. 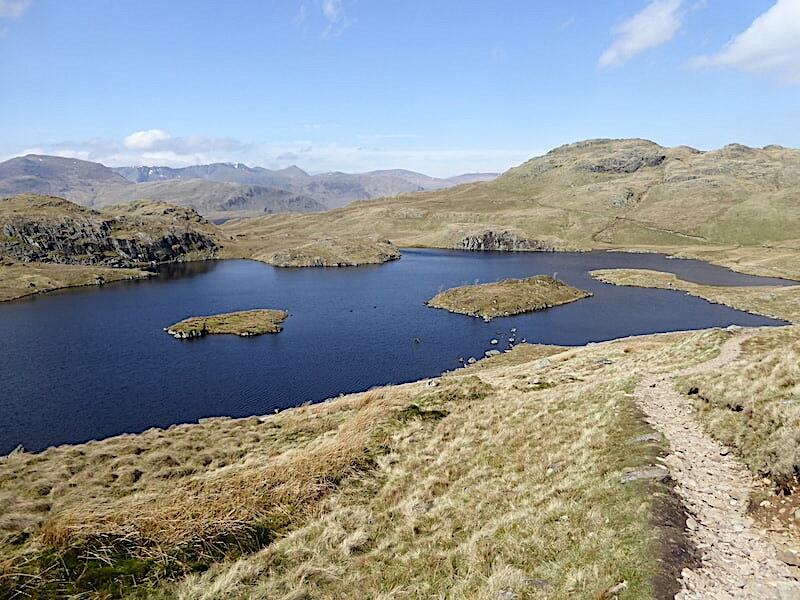 A very enjoyable little route up to Angle Tarn and beyond. 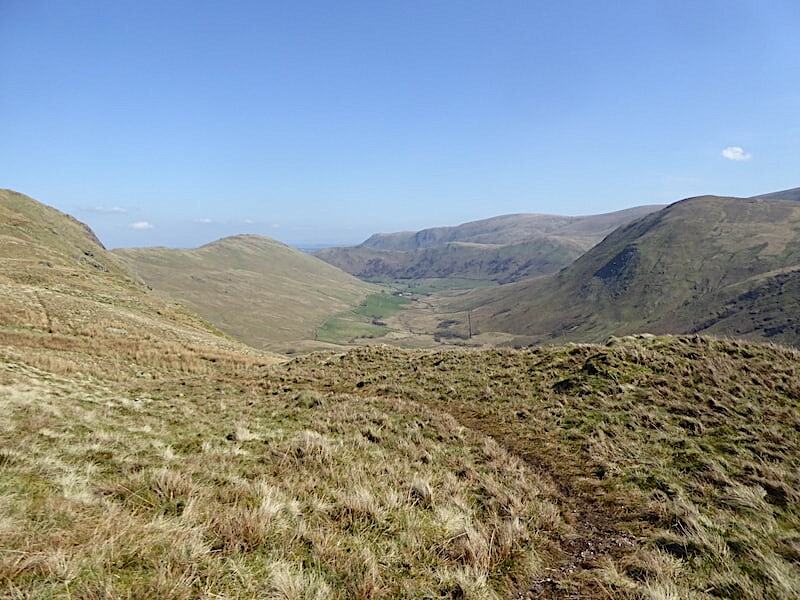 Our jackets are back off again as we had a sunny spell while crossing the peat hags and climbing up to the summit although my jumper is still handy on the outside of my pack, just in case. 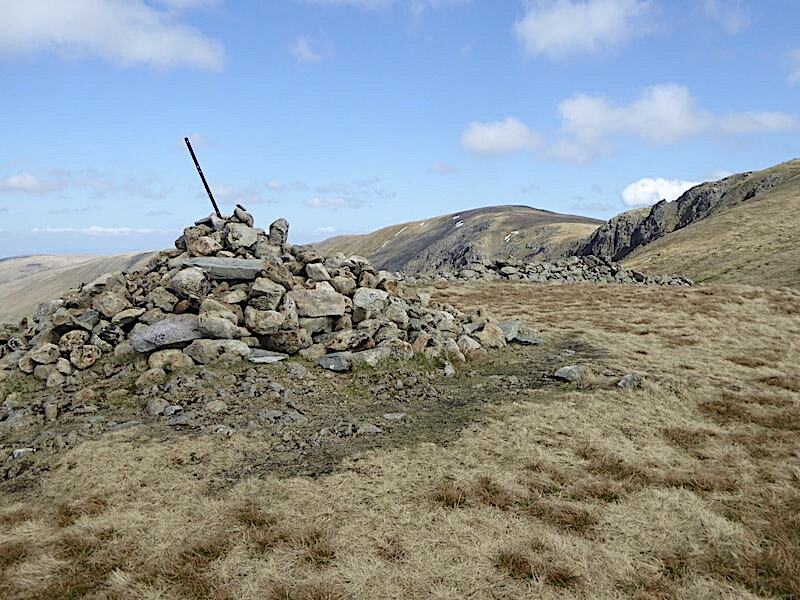 Summit time comes to an end and back down we go to do battle with the peat hags once again. Through the gap in the wall and then a right turn to follow it all the way up to the top, with a few squelchy little hollows to deal with here and there along the way. 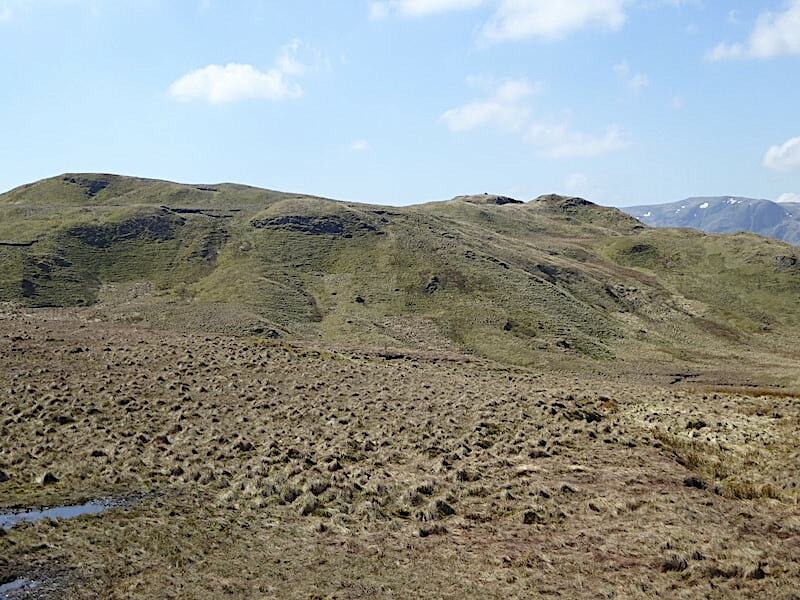 A view of The Nab’s extensive peat hags from a collapsed section of the wall and then we carry on up the slope, eventually veering away from the wall to reach the top and …..
….. begin the return leg back to Angle Tarn with this view of Brock Crags ahead of us for a good part of the way. It was roughly about here when we’d realised earlier on that we were not on the path we wanted to be on and then had to drop down to the one in the shot below. 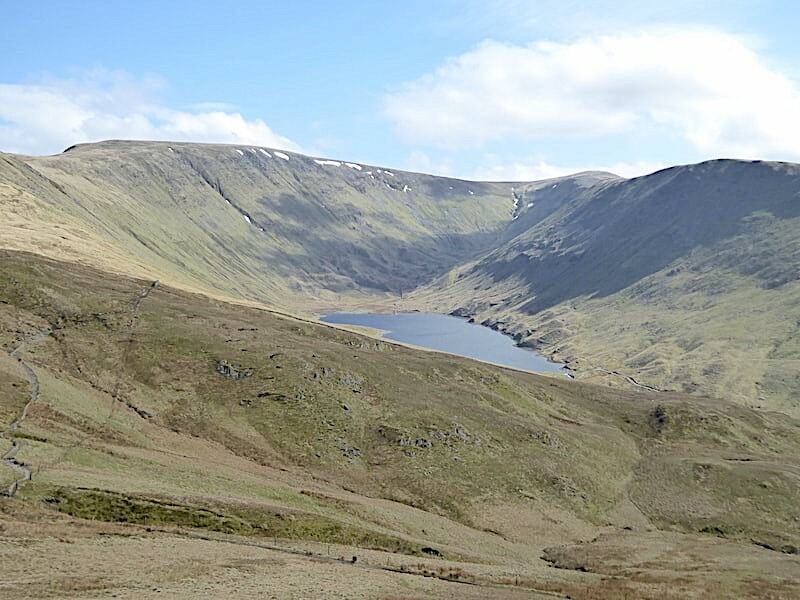 All’s well that ends well, as the saying goes, and this view of Hayeswater is much brighter than the one I took at the time. 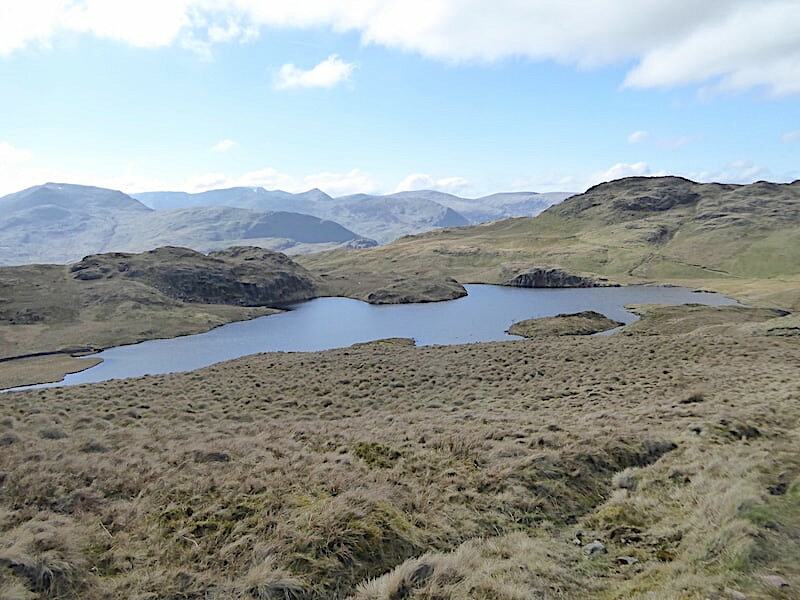 On we go, over the rocky area towards Brock Crags …..
….. and eventually back to a deserted Angle Tarn wondering why there isn’t anyone around. Perhaps it just isn’t warm enough yet to be sitting around having picnics and paddling. We stop for a few minutes once more just to have a drink and enjoy the solitude and then off we go again …..
….. leaving Angle Tarn behind and making our way back down to the wall coming up from Bannerdale, while a Swaledale stares keenly and wonders what the heck to make of us. The high level path across the slopes where, despite appearances, there is no sense of exposure, neither of us would be walking it if there was, and which presents nothing by way of difficulties along its route. Looking back across to The Nab from the little hollow containing the small tarn, which is off to the right of the shot in the shadowed area. Trace back along the path and you can see it just beginning to rise up to the higher level on the extreme right of the shot. 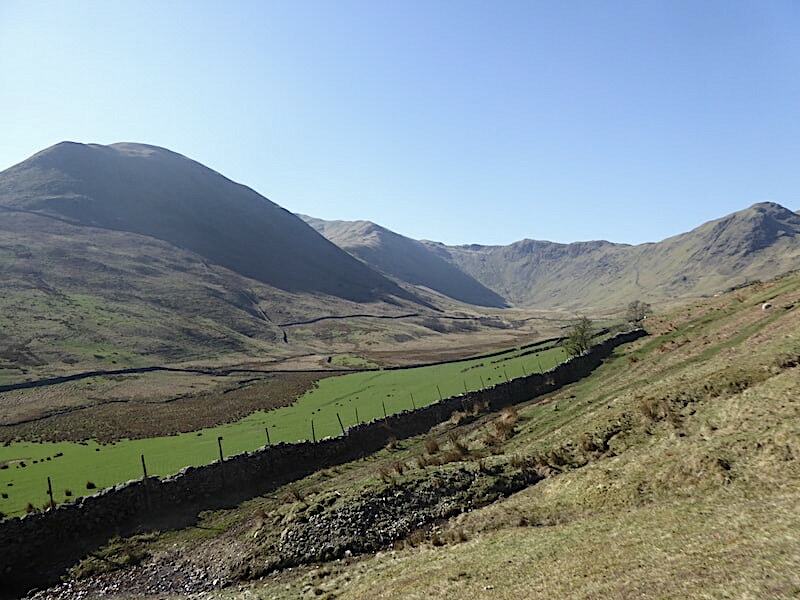 Back in the sunshine and out of the wind so now we just have a easy stroll back along the valley to our start point at …..
….. Dale Head Farm and the end of today’s walk. The metal gate is still propped up against the wooden one so once again we have to climb over the little wooden fence beside it and then follow the lane between the house and the outbuildings back to the car. At just under eleven miles that’s our longest walk of this year so far and its remarkable what can be done in favourable weather and with that extra hour of daylight on the clock. Walking unhindered by thick winter clothing with no need to keep a watchful eye on the time makes a very welcome return.